​It is quite obvious that main purpose of buying a food dehydrator is to prepare healthy food and snacks like dried peaches, apples, cherries, pineapples, bananas, mangoes, tomatoes, etc. A food dehydrator not only dries it but also maintain the quality content of the food. You can make a number of delicious recipes with this product easily at your home. So, if you have a food dehydrator at your home, then you can better take care of your family with the healthy snacks prepared by this appliance. ​If you are a health conscious person and on a strict diet of raw food, then a food dehydrator is the best thing which can help in following your diet chart exactingly. A perfect food dehydrator possesses a feature of an adjustable thermostat that helps in maintaining accurate temperature while heating the food. When you buy this appliance, a manual book is also provided by the manufacturer for your assistance in setting the product’s temperature. So, after consuming food prepared from the food dehydrator you can maintain your health without any worries. ​You cannot buy each and every food item in all the seasons as there are so many types of foods and vegetables which are available seasonally in the market. A food dehydrator let you purchase additional foodstuff during any period of the year and you can dry it for consuming that later. Certain fruits such as bananas, strawberries, mangos, and cherries usually sell by the sellers on sale if these are produced abundantly. A food dehydrator offers you a mode to purchase more than you required at present on sale which you can dry for the later consumption. For instance, you have purchased a box of ripe bananas and you used some of them for making banana pie and dry out the left bananas for creating wedges. ​When you plan out for an outside camping or a backpacking, it is always advisable that you carry all the lightweight things with you. But have you ever imagined carrying lightweight food stuff? Not yet? Now, this is possible with the help of a food dehydrator as it not only prepares tasty food items but also provide you the lightweight foodstuffs. 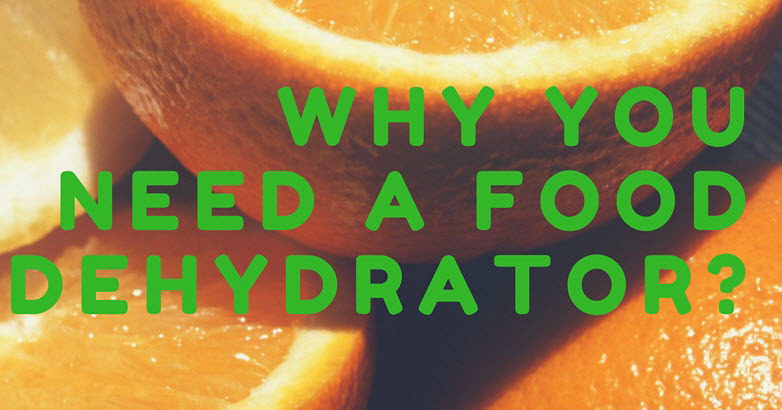 During the dehydration process, all the water content is removed from the food that usually adds up to its weight. For example, you can carry a watermelon in the dried form with you as chips along with the tomatoes sauce in the similar form. ​If you love to do gardening but does not get enough time for handling all the food which your garden yields, then a food dehydrator provides you the best way to preserve some foods for the later use. Having a food dehydrator at your home will benefit you a lot in drying out food items like carrots, parsley, corn, peppers, tomatoes, peas, horseradish, garlic, etc. When you want to use these vegetables in the soups or stews, you just have to rehydrate them. You might also prepare vegetable chips as well as powders to be used in sauces, soups, seasonings and salads. ​A food dehydrator is the most effective and flavour-conserving method to dehydrate herbs along with the natural flavor and smell. Under the controlled temperature of around 90 degrees F to 105 degrees F, you can normally dehydrate the herbs in one to three hours. The herbs can include basil, mint, mustard, ginger, thyme, dill, and rosemary. You can use these herbs for increasing the taste of the dishes by sprinkling over them in the small amount. ​If you want to replace numerous costly snacks with the healthier foodstuff then, you need to have a food dehydrator at your place. There are so many extensively available fruits which can become the great snack for you during the work or play any sport. You can try dehydrating fruits like apricots, apples, peaches, bananas, pineapple, blueberries, kiwi, strawberries, plums, grapes and pears. You can also prepare some exceptional combinations of fruits by using fruit leathers along with other healthy constituents. Fruits leathers can also be made in some models of the food dehydrator on the mesh trays. ​For several numbers of people, preparing jerky is the chief purpose of owning a food dehydrator. Food like Jerky is a lean as well as the tasty source of protein. In the dried form, you can take the jerky with you during mountaineering, working outdoor, or even studying in the public library. It will work as a light lunch for you. Everybody knows that a store-bought jerky is very costly and doesn’t taste better than the jerky which you prepare at your home in the dehydrator. Besides the jerky, you can also make meat items like beef, turkey jerky, and fish. You might also make dried jerky spices also for adding more taste into your food. ​When a food is heated in the even temperature of the dehydrator, then its nutritive content does not get disappeared like a canned food. You just have to store it perfectly so that it remains healthy and nourishing for longer time period i.e. from weeks to months. If you want to preserve it for more than a year, then it’s better to store it in a refrigerator without adding any form of preservatives and chemicals. ​Food dehydrators concentrate and strengthen the natural flavors of food by decreasing the marinating time. So, if you are fond of cooking like a chef then you can make so many items easily at your home which a professional cook can prepare like thick pulps, cacao butter, ferment yogurts, and much more health stimulating probiotic-rich food items. ​As you know the prices of fruits and vegetables never get the decrease, so we usually try to avoid the wastage of the foods. Having a food dehydrator will never allow any food’s wastage. You can dehydrate your surplus fruits as well as vegetables in the food dehydrator in order to lengthen their shelf life for around two years. This will not only helps you in making proper use of the excess foodstuffs but also aids in the utilization of your money that you incurred while buying these foods. ​In order to consume 100 % natural foods, a dehydrator is the best thing to use. During the dehydration of foodstuffs, the one and the only thing that is required is the food item in the natural form. This appliance maintains all the natural content like vitamins and fibers of the food even after the dehydration. Only the water content is removed from the food without affecting its nutritive content. This process is very dissimilar from the cooking and steaming on the gas stoves. ​Nowadays, it is very significant to remain ready for any unusual things which may happen unexpectedly. That is why a person needs to have an endurance kit in reserve. So, all types of dehydrated foods that can last for lengthier time period can be a great accumulation to the endurance kit. This will be a healthier option than the artificially preserved foods. Thus, having a food dehydrator in your kitchen will help you a lot during any unexpected situation. ​During the process of food dehydration you just need only one single ingredient i.e. the food which you want to dehydrate. The outcome of the dehydration process is 100% natural food which will not only taste delicious but also remain nutritive for several months. Hence, you can simply say no to the dried food snacks that are available in the market which usually contains chemical additives and preservatives in it. ​When you bought any fresh food items from the market, it needs refrigeration so that you can use it for longer time period. But this is not in the case of food dehydration. A food dehydrator helps you to dehydrate the food by eliminating the water content from it so that you can store it an air tight container or pouch. For dehydrated foodstuffs, there is no requirement of refrigeration as there is no possibility of development of microorganisms in such types of foods. A food dehydrator is one of the best appliances that must be present in every kitchen nowadays. People are becoming more health-conscious so they want to consume healthy foodstuffs and this can be easily achieved through a food dehydrator. If you still not have purchased this amazing appliance then, after reading the above information you will surely buy this product in order to provide healthy food to your family members. When people eat the food prepared through this appliance, they also reduce their chances of becoming prone to diseases. In fact, your kids will also get fond of the delicious snacks prepared by the food dehydrator and forget the candies available in the market. Overall, buying a food dehydrator will not only help you in being healthy but also benefits the people around you.